Music and food complement each other at this Napa location of the famed jazz club. 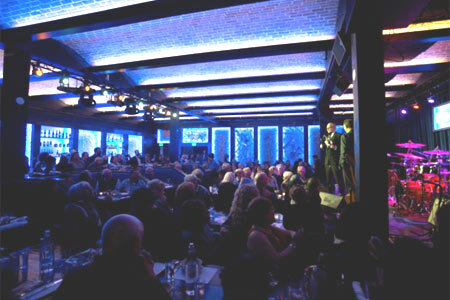 : New York's famed jazz club Blue Note has satellites around the world, including Hawaii, Milan, Tokyo and now Napa. Housed in the historic Napa Valley Opera House, the space is bathed in blue light and decorated with musical instruments mounted on the walls. A bar, booths and tables face a stage where local and national touring artists perform two sets a night, generally at 7 p.m. and 9:30 p.m. (Larger concerts are held upstairs in the Jam Cellars Ballroom at the Margrit Mondavi Theatre.) The music is the star of the show, and the food comes as a complement. Skip the duck confit tacos in favor of a more reliable starter, like the artisanal cheese board. Move along to crispy half chicken with wild rice risotto, Brussels sprout leaves and roasted cauliflower or the roasted lamb sirloin with cauliflower purée, quinoa, sultanas and pickled ramps. End on a sweet note with chocolate mousse or the "Arnold Palmer" lemon bar with black tea foam. Keep an eye out for special "food & music pairings" inspired by visiting performers. The wine list highlights local wineries, and there's also a selection of domestic and international beers, plus a full bar.